Finland is ripe for bringing exciting travel itineraries to life. A country of boundless natural escapades, hub of the sauna culture, famous for Lapland, home of Santa Claus, and, of course, the Northern Lights – the most stunning view of the polar sky. Most importantly, the country is served by a very efficient airport hub that connects mainland Europe and the Far East with its bounty of strategic advantages – several budget connections, high speed transits and so on. The fastest and most direct route from Asia to Europe is through Helsinki airport. With the perfect Stopover Finland programme, if flying Finnair or the easy Fly Dubai connectivity, there is no reason why you shouldn’t give this Scandinavian adventure a try. Especially since Finland’s capital seems to be having it all: restaurants, shops, museums, concerts, and beautiful design and architecture. 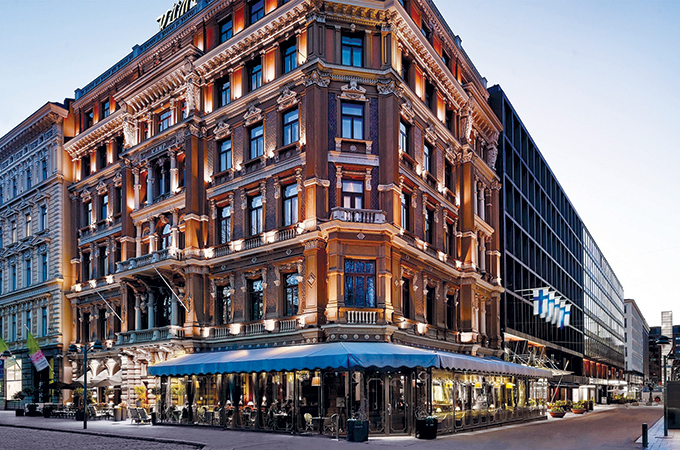 For the luxury lovers, the place to stay is Hotel Kämp, which has been the landmark of Helsinki since it was established way back in 1887. Hotel Kämp has been an integral part of Finland’s history, having celebrated its 130th birthday. The timeless hotel has been a home away from home for artists, ruling elite and intelligentsia. As one can guess, the walls have lots of stories to tell. Kämp Collection Hotels boasts some of Finland’s most reputable hotels, restaurants and luxury Spas with a turnover of 76 million euros in 2017. Kämp Collection Hotels’ comprises Hotel Kämp, the luxurious Hotel St. George (opened last summer), and a host of other individual properties including the popular lifestyle hotel chain GLO. The very-best-or-nothing mindset of the new-age traveller is what Hotel Kämp is all about. The hotel’s location on Esplanadi, Helsinki’s main shopping street, is excellent and leaves nothing wanting. Set within the complex of the property, the shopping plaza, Kämp Galleria presents the best of Scandinavian design, with easy access to the neighbouring atmospheric of Esplanadi park. Shoppers may access more than 40 top fashion and design shops and high-quality restaurant and beauty services across three floors. What’s more, the Stockmann Department Store, a few steps away, offers a wide selection of inspiring, quality products from top fashion, cosmetics, Finnish design, souvenirs, home products and groceries as well as cafés and restaurants. The recently renovated Hotel Kämp features 179 luxurious rooms ranging from deluxe rooms to 15 suites – of which the largest and most opulent, Mannerheim Suite (258 sqm), begs a mention. Fancy a Nordic wedding or the meeting of heads up north? The Mirror Room makes for the most iconic venue in all of Finland. The Mirror Room is the most legendary ballroom in Helsinki and every bit as ethereal as it sounds. Totally restored and lavishly decorated to pamper up to 150 guests, the Mirror Room becomes the ideal venue for a gala dinner, a ball or weddings. The Hotel Kämp Brasserie is a perfect spot for relaxing and watching the people passing by while enjoying a wonderful lunch or dinner. In fact, we recommend you start the day at the outlet, which easily transports diners to a world of grandiose, where the most authentic Finnish recipes are served with the most exclusive views of the Esplanadi, alongside the elective servings of the breakfast platter. Kamp Spa, the rooftop adobe of wellness, is the only spa in Finland that specialises in ESPA luxury products. This is the truest experience of traditional Finnish sauna and the soothing eucalyptus fragrance of a steam bath. The Sauna lounge is where one can enjoy heated divans while sipping luxurious beverages. Chocolate lovers around the world now have a new holy pilgrimage to make, but it happens to be housed in the building across from the hotel, so whatever you do, don’t give it a miss. Karl Fazer Café founded in 1891 is the flagship for Fazer's chocolate empire and perfect for buying baked goods, sandwiches, enjoying ice cream and cakes, not to mention a staggering variety of chocolate bars, with flavours varying from irresistible to bizarre.